How to best move to inclusion of refugees in and through sport across Europe? 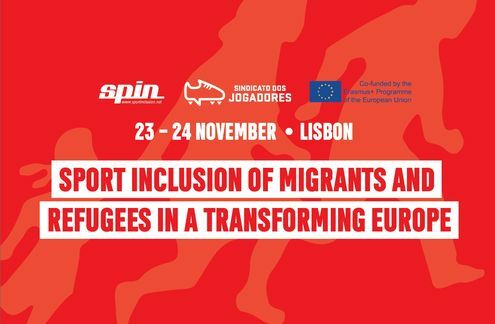 This and other issues were addressed by the European conference “Sport Inclusion of Migrants and Refugees in a transforming Europe“ in the City of Football in Oeiras (Lisbon), the headquarters of Portuguese Football Association. The event bought together more than 100 participants from different sport stakeholders – ranging from grass-roots to the professional level - to share experience and good practices. The conference was organised by the SPIN (Sport Inclusion Network) as part of the “Sport Welcomes Refugees” project. Joaquim Evangelista, president of the Portuguese Players' Union, one of the eight SPIN partners kicked off the conference, was calling for unity among all in supporting the integration of migrants and refugees. "In Portugal, football has a greater responsibility, proportional to its social and economic impact. Persecutions, conflicts and violations of human rights concern us because of the fragility of the situation in which these people are. We cannot ignore this context. The refugee crisis is a problem that requires courage, active citizenship, cooperation and commitment," said the president Portuguese Players' Union, who organised the conference. The view was shared by Kurt Wachter of fairplay-VIDC, the coordinator of the SPIN network. He stressed the importance of sport as a tool for social inclusion: "In 2015 when we saw so many refugees from Syria, Afghanistan and Iraq arriving in our cities, sport played a great role to support refugees and integrate them." Fernando Gomes, president of the Portuguese Football Federation (FPF) and vice-president of UEFA , gave the example of players such as Eusébio, Coluna, Nani and Bruma who were successful in football due to "responsible sports inclusion policies and practices." In order to integrate migrants and refugees into society, there is nothing better than sport, according to João Paulo Rebelo, Secretary of State for Youth and Sports in Portugal: "There is currently no better vehicle for jointly promoting the values of social inclusion, of the collective thought of union, friendship, solidarity, among many other values of an ethical nature, and not only, essential for a civilized and healthy life in society." The first day of the conference was marked by two panel seesions and four workshops. Pedro Calado (High Commissioner for Migration), Mário Rui André (Refugee Support Platform), Tito de Matos (Director of the Shelter for Refugees), Varpu Taarna (Ministry of Economic Affairs and Employment of Finland) and Paulo César Teixeira (Councilor for Sport of the Municipality of Odivelas) discussed how sport can contribute to the construction of a diversified and inclusive Europe. Mário Rui André gave his example, revealing that he was in Greece receiving people from Syria: "It was there that I realized that these people lived in situations that were perfectly degrading in terms of human dignity and when we look at them we have to respect them." In line with what was said by the representative of the Platform for Support to Refugees, Tito Matos said that "access to sport is very important for migrants and refugees as a therapy, because we are talking about people who have experienced very traumatic situations and great suffering in humanitarian terms." Paulo César Teixeira revealed that the City Council of Odivelas has the concern of integrating the refugee children who attend the schools of the county: "We try to involve them in the school community, in the sphere of sport, integrating the family of children refugees in society." The High Commissioner for Migration, Pedro Calado, stressed that the inclusion of migrants and refugees is "a matter of the greatest social and political importance in the current day and a challenge for the whole community." The second round table, which was attended by speakers Francisca Araújo (Social Responsibility department of FPF), Ana Ribeiro (Social Responsibility department of the Portuguese League), Obert Makaza (Galway Bridge Project), Aisha Albella (FC Barcelona Foundation) and Jonathan Fadugba (Fare network), addressed the challenges and needs of sporting, migrant and refugee organisations for social inclusion through sport. Francisca Araújo revealed that the FPF has worked in partnership with the Olympic Committee of Portugal and the Platform for Support to Refugees in the development of various activities. "Social inclusion involves the integration of people in our organization and we are working towards this", he said. "We have included refugees and migrants in our work teams, through volunteering, namely in the organisations of the events of the Portuguese League." The first day of the SPIN conference in the City of Football ended with four workshops, which presented practical examples of the work being done with migrants and refugees in European organisations, sharing experiences in different countries. The event continued on Saturday, November 24, with two round table discussions. One was on the empowerment of women with a minority and migration background and a panel with ex-players discussing the involvement of athletes in social inclusion activities. The latter session featured Cynthia Uwak, two times African footballer of the year and nominee for the FIFA World Player Award. The Sport Welcomes Refugees project is co-funded by the Erasmus+ sport programme of European Commission, project partners are fairplay initiative at VIDC (Austria), Camino (Germany), Football Association of Ireland (Ireland), Mahatma Gandhi Humans Rights Organization (Hungary), Liikkukaa (Finland) , UISP (Italy) and FAROS (Greece).